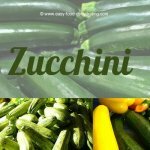 Consider using plastic lidded bins for easy closet, walk-in pantry, or garage storage, of dehydrated foods – for long-term storage. 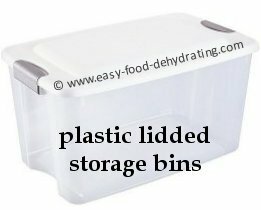 Plastic Lidded Bins - Great for Stacking. Store Your Packed Mylar Bags Safely! It's better if you can find stack-able bins that you can't see through as it helps to keep the light out. All you have to do is clear off some shelving in the garage. PLEASE NOTE: This bin shown at the top of the page is NOT airtight, i.e. some air can get in around the handles – so it's pointless using a 2000cc oxygen absorber in these types of bins. How about stacking these boxes in an unused or barely used closet in the house (I prefer closets, personally, or a shelving unit assembled on a "spare" wall - check this out!). Remember to write the contents on the bin's side and put the date on the bags that go in the bins! (See more below). Also note that when using AIRTIGHT large containers, we are using the 2000cc large oxygen packs IN ADDITION to the 100cc oxypacks that are already IN our sealed packages. Just place the 2000cc loose oxygen pack in the airtight container, along with your Mylar bag packets. Remember, these large bins are NOT going to be opened on a regular basis, maybe twice a year or so, as we use up and rotate our stock. There are plastic lidded bins available that have snap-on lids that are truly airtight – like bucket lids – so use the 2000cc oxypack with those types of storage bins. 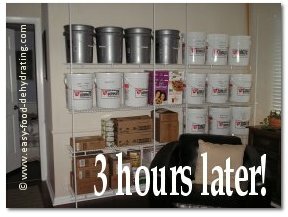 When it came time to build my food storage wall, I made sure that there was enough room between the shelves (height-wise) to fit the bins. It's easy to change the factory-set shelf heights; simply drill new holes in the uprights! Use a nail and hammer to make a 'starter dimple/hole' in the uprights, so that your drill-bit doesn't wander when you first start drilling. Make sure you're using a drill bit that's suitable for metal, too. Consider buying deep(er) shelving units so you can store your bins with the narrow side facing out, rather than the wide side facing out like I did. You'll be able to store more bins that way. You're always wiser after the event! NOTE: You can also use buckets! Yes, feed buckets – check out the Feed Bucket page. You'll see great screw-on lids that just about guarantee to keep your flour bug-free! You can also stack the buckets, just make sure to put the heavy ones ON the bottom of the stack so you don't get a nasty knock to the head if one should tumble on you! Keep safety-first in mind at all times.